Halloween was cancelled again, for the second year in a row. Last year it was a bizarre snow storm in late October that closed down our town, took out numerous trees and power lines and even portions of some homes. Much of the northeast was affected and trees became the obsession for us all, or more precisely, how to get a tree guy to return our calls. This year it is “Frankenstorm“, and tree services are guaranteed another banner year. Dan Dostal had started his tree service company three years prior to last year’s October snow storm, and while his business was doing well, there is no better marketing than a big dose of Mother Nature. It has been a year since that freak storm and Dan is still cleaning up the damage. In addition, his area also experienced a tornado and that offered up even more opportunity. Dan’s success with Dostal Tree Service is the result of hard work and experience. After getting his degree from the vocational high school in his town, Dan went to work for the town of Northampton, Massachusetts as one of the tree crew. He loved it—great hours, top notch equipment, and benefits. But, eight years later he became unemployed and he opted to go back to school to get certified in heating and air conditioning. Unable to find work upon graduation, he started doing small tree jobs for family and friends. These odd jobs quickly snowballed and he suddenly found himself doing tree service work again on a full-time basis. In 2010, Dan’s parents loaned him $10,000 to buy equipment and he went back to school to become a certified arborist. As he resumed work as a tree service professional, Dan realized what had been missing all those years when he worked for the town. Tree work is dangerous and if he was going to take that risk, he wanted to work for himself. Dan’s Dad works with him at his company—he is the proud father who carries a supply of business cards in his pocket at all times. Every hardware store, barber shop and deli within miles has a “Dostal Tree Service” card pinned up on it somewhere. His father’s marketing tactics and word of mouth got his business off the ground quickly. 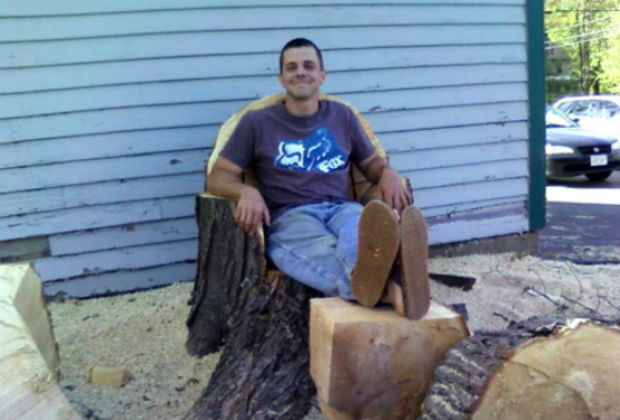 His brother-in-law created a website for him, bringing in about half of his business, as his was one of three tree services in the area that came up on Google when people searched. In the three years since striking out on his own, Dan has repayed his parents, qualified for a loan from the local bank to upgrade his truck and equipment and obtained key certification. He loves his life—his independence, his satisfied customers and his Dad, who has since retired and works with Dan every day. His dad is responsible for clearing what comes down and making the yard look remarkable—that finished product may be his biggest competitive advantage! In addition to Frankenstorm, the insects are heading this way according to Dan—Asian long-horned beetles and emerald ash borers—and they will likely bring down a lot of trees. For those of you who love the outdoors, have fond memories of your tree house and are seeking employment, there may be no better time to apprentice, get certified and buy a hardhat… the storm and the bugs are a comin’! When Craig Bowman lost his job he started a business. Watch and learn about Scientific Graffiti illustrators. ⇐ Join the CareerFuel Community!